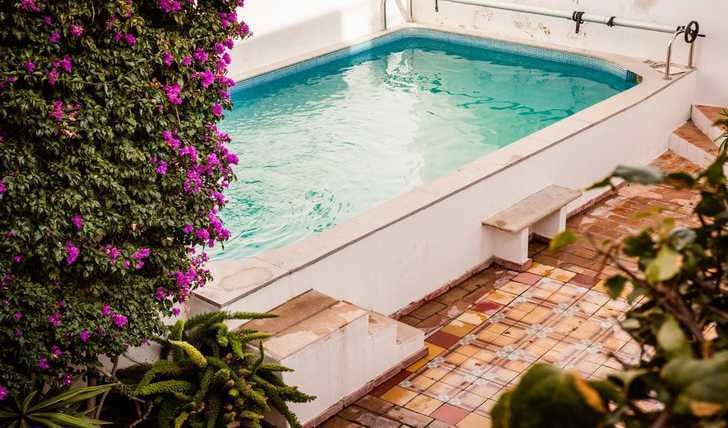 Set on a quiet street just five minutes from the sea front and a short walk from our art school, the Pool House is rumoured to have been owned by the owner of Olhão’s first bank some 150 years ago. Beautifully restored, this deceptively large house is a typical example of Portuguese architecture - a really enchanting house with beautiful courtyards and its own swimming pool. Smaller than The School House, we can sleep up to 8 people here, in spacious en-suite double rooms - three on the first floor and one at the top of the house. There is plenty of space inside and out to eat, relax, swim or sketch, including a large sitting room, a lovely garden and two terraces. Hairdryers are available in each bathroom, along with premium botanical shampoo, conditioner and shower gel. Both bath and swimming towels are provided The Pool House is fully equipped with BBQ, tables and chairs, sun loungers, a fully fitted kitchen, a washing machine and dishwasher.